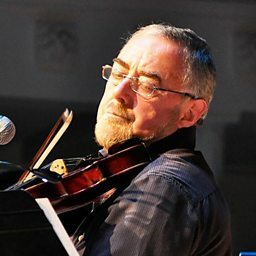 Mairéad Ní Mhaonaigh (born 26 July 1959) is an Irish fiddler and the lead vocalist for the Irish folk music band Altan, which she co-founded with her late husband Frankie Kennedy in 1987. Today, Mairéad is recognised as a leading exponent in the Donegal fiddle style, and she is often considered as one of the foremost singers in the Irish language, her native tongue. She was part of the Irish supergroup T with the Maggies who performed in January 2009 at Temple Bar TradFest in Dublin their first ever two concerts under that name and who released in October 2010 their debut (and to date only) album. After nearly 22 years with Altan, Mairéad released in February 2009 her debut solo album Imeall. After 29 years with Altan, Mairéad released in October 2016 her alternate band Na Mooneys' debut album Na Mooneys.